﻿﻿Systemic biologic therapies are integral components of the treatment armamentarium for moderate-to-severe psoriasis.1 Anti-tumor necrosis factor (TNF) agents and the interleukin (IL)-12/23 inhibitor ustekinumab are well-established agents and, in the past two years, two additional important agents have been added to the list, with inhibitors of IL-17 (ixekizumab and secukinumab) approved for use in Canada.2 Another inhibitor of IL-17, brodalumab, was approved recently in the United States (U.S.) and is expected to be approved in Canada in the near future. The Annual Scientific Meeting of the American Academy of Dermatology (AAD) is one of the most important conferences at which new research with existing and emerging agents is presented. This year’s event, held in Orlando, Florida, from March 3 to 7, continued to show that the next wave of potent biologics to become available for moderate-to-severe psoriasis will be the anti-IL-23 biologics (e.g., guselkumab, tildrakizumab and risankizumab). This report provides a summary of the key highlights of new research with the IL-23 inhibitors presented at AAD 2017. It also summarizes research that adds to our understanding of the efficacy, safety and clinical use of already-approved biologic agents. In VOYAGE-2, patients were randomized to receive guselkumab 100 mg at weeks 0, 4, 12, and 20, or placebo at weeks 0, 4, and 12, followed by guselkumab 100 mg at weeks 16 and 20, or adalimumab 80 mg at week 0, 40 mg at week 1, then 40 mg every two weeks through week 23.4 The co-primary endpoints were the proportion of guselkumab vs. placebo patients achieving ≥ 90% improvement in the Psoriasis Area and Severity Index score (PASI 90) and an Investigator’s Global Assessment (IGA) score of cleared (0) or minimal disease (1) at week 16. The key secondary endpoints were efficacy assessments of guselkumab vs. adalimumab at week 24. Additionally, researchers showed that among patients in RESURFACE-1 and -2, more than half the patients who were subsequently randomized to treatment discontinuation experienced a relapse (reduction in maximum PASI response by 50%). 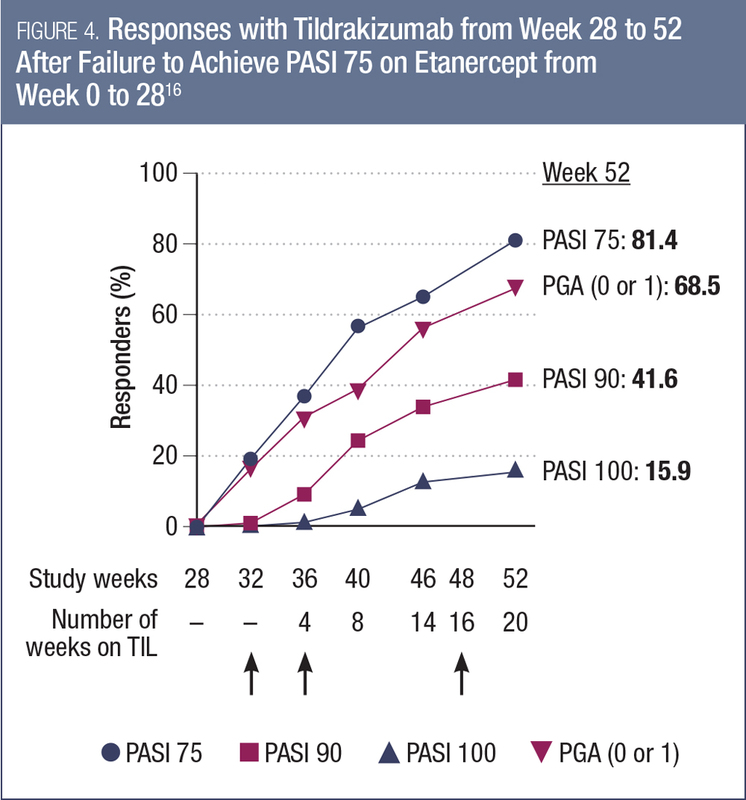 Most of these patients (approximately 85%) were able to recapture a PASI 75 response with tildrakizumab retreatment.17 Among those who continued on tildrakizumab after week 28, PASI 75 was maintained in 89-94% of patients, depending on the dose. RISANKIZUMAB. Although there was no new research with this agent presented at AAD 2017, risankizumab was mentioned in several overview presentations. It has previously demonstrated favorable results relative to ustekinumab in a head-to-head phase 2 study18 and is now being investigated in phase 3 studies. IXEKIZUMAB. Although ixekizumab already has been approved for use in Canada on the basis of its clinical trial program, additional data continue to accumulate. The most noteworthy data presented at AAD 2017 for this agent were the 24-week results of the IXORA-S study, comparing ixekizumab to ustekinumab in 302 patients with moderate-to-severe plaque psoriasis.19 Ixekizumab was administered with a 160 mg starting dose at week 0, followed by 80 mg every two weeks through week 12 and 80 mg every four weeks thereafter (n = 136). Ustekinumab was administered (45 mg or 90 mg by weight) at weeks 0, 4 and 16. 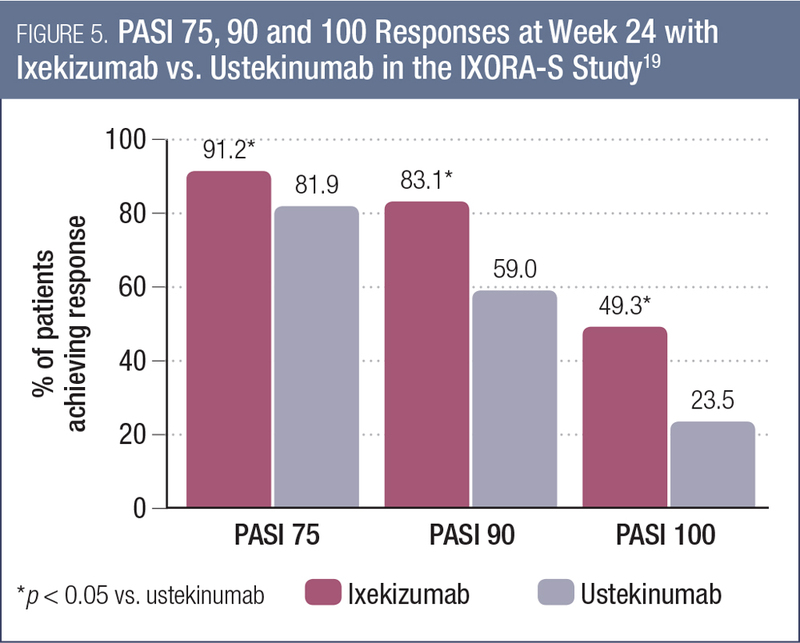 As shown in Figure 5, the PASI response rates were significantly higher with ixekizumab compared to ustekinumab at week 24 (each comparison p < 0.001).19 The proportion of patients achieving a DLQI score of 0 or 1 also was significantly higher with ixekizumab (66.2% vs. 53.0%, p < 0.05). There were no significant between-group differences in overall rates of adverse events. This study is ongoing, with follow-up to continue to week 64. While most of the originator anti-TNF agents have concluded their clinical trial programs, the primary results of two phase 3 studies of certolizumab pegol (CZP) in moderate-to-severe plaque psoriasis were presented at the 2017 AAD meeting.55 This agent, which is currently approved for psoriatic arthritis in Canada, but not plaque psoriasis, was evaluated in two identically designed phase 3 studies, CIMPASI-1 and CIMPASI-2. In the two studies, a total of 461 patients were randomized to placebo, CZP 200 mg or CZP 400 mg every two weeks. 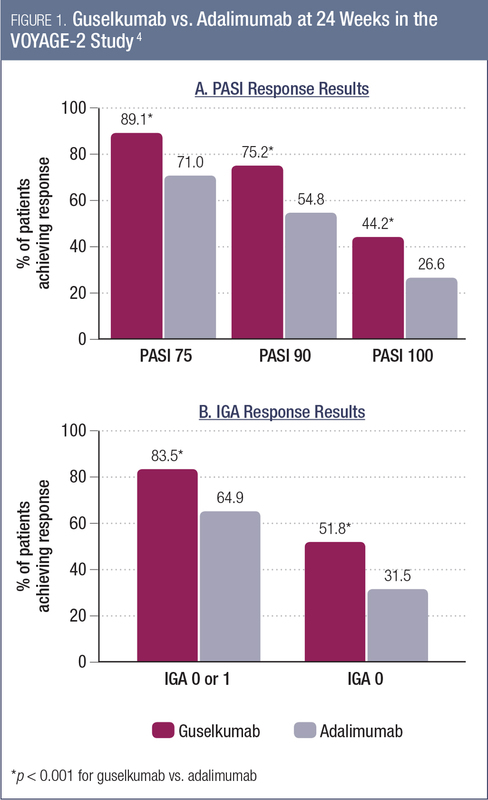 The primary endpoints were PASI 75 and Physician Global Assessment [PGA] 0/1 responder rates at 16 weeks. CZP achieved PASI 75 and PGA 0/1 response rates that were superior to placebo at the week 16 analysis. PASI 75 rates for placebo were 6.5% and 11.6% in CIMPASI-1 and -2, respectively, while those for CZP 200 mg were 66.5% and 81.4% and those for CZP 400 mg were 75.8% and 82.6% (all comparisons vs. placebo p < 0.0001).56 PGA 0/1 responses were achieved by 4.2% and 2.0% of placebo-treated subjects in CIMPASI-1 and -2, respectively, while the rates were 47.0% and 66.8% for CZP 200 mg and 57.9% and 71.6% for CZP 400 mg. There were no new tolerability or safety signals seen with CZP in these studies. TNF INHIBITORS AND VASCULAR INFLAMMATION. A Canadian study presented by Dr. Robert Bissonnette at AAD 2017 compared the impact of treatment with the TNF inhibitor adalimumab or placebo on vascular inflammation among 107 patients with moderate-to-severe psoriasis.56 Using previously validated 18fluorodeoxyglucose (FDG)-positron emission tomography (PET) scanning techniques, the researchers found that there was no difference in vascular inflammation over 16 weeks between adalimumab- and placebo-treated patients. 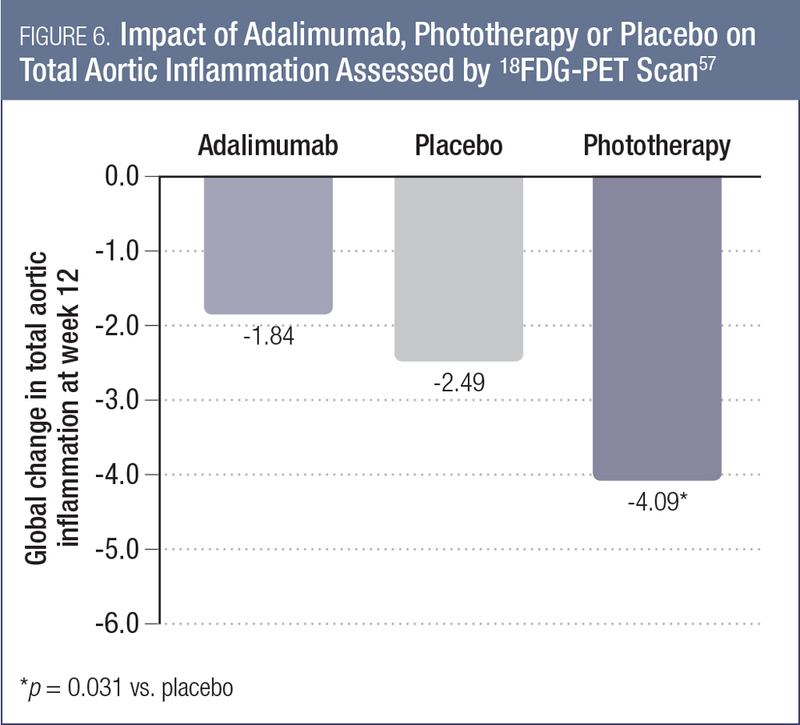 In fact, there was a modest increase in carotid inflammation observed with adalimumab at 52 weeks compared to placebo. There were some key themes that emerged among the many psoriasis-specific symposia at AAD 2017. PSORIASIS AND CARDIOVASCULAR DISEASE. With respect to cardiovascular (CV) morbidity among patients with psoriasis, the consistent message was that patients with psoriasis are at elevated risk of CV disease. While the evidence shows that the risk is highest among patients with severe psoriasis, even those with mild disease have an elevated risk relative to the general population. Accounting for this elevation in risk when using CV risk calculators (e.g., Framingham Risk Scores) is a work in progress. The impact of psoriasis treatments on CV risk also is a matter of some debate, with no clear consensus having emerged, and some assumptions challenged by recent data (e.g., proposed benefit of TNF inhibitors on CV risk challenged by the above findings with respect to vascular inflammation). BIOSIMILARS. The continued emergence of biosimilars for anti-TNF therapies was the focus of several presentations at AAD 2017. Presenters discussed the regulatory requirements for these agents (chiefly in the U.S. context), the potential for cost savings and the theoretical enhanced access to biologic drugs, and outlined some of the concerns that have emerged during the debate on biosimilars in the U.S. Among these is the concern that multiple biosimilars of the same originator biologic may have proven to be equivalent to the originator, but may not be equivalent to each other, which could have an impact on patient outcomes when switching between these agents. The key points in favor of the anti-TNF agents is that they have excellent efficacy, favorable impact on key common comorbidities (e.g., psoriatic arthritis, inflammatory bowel disease) and have a well-established safety record, with millions of patients having been treated with these agents. Working in favor of the newer agents is their unparalleled efficacy in terms of skin clearance, with PASI 90 responses expected in more than 80% of patients treated with these agents, and full clearance a possibility for a substantial minority of patients. Research to date also has suggested that these agents have a safety profile similar to that of the anti-TNF agents, with no major safety concerns having emerged (with the exception of the SIB concern with brodalumab). Regardless of the treatment chosen, the accumulation of research and clinical experience with biologics in psoriasis, amply augmented by the work presented at AAD 2017, provides clinicians and patients alike with a wealth of evidence-based, efficacious and safe choices for the treatment of moderate-to-severe psoriasis. 1. Canadian Psoriasis Guidelines Committee. Canadian Guidelines for the Management of Plaque Psoriasis, June 2009. http://www.dermatology.ca/psoriasisguidelines. 2. Health Canada. Notice of Compliance On-line Database. https://health-products.canada.ca/noc-ac/index-eng.jsp; Accessed March 2017. 3. Blauvelt A, et al. Level of efficacy and safety of guselkumab, an anti-interleukin-23 monoclonal antibody, compared with adalimumab for the continuous treatment of moderate-to-severe psoriasis in the phase 3 VOYAGE 1 trial. Presented at EADV 2016; Presentation #D3T01.1D. 4. Reich K, Armstrong AW, Foley P, et al. Efficacy and safety of guselkumab compared with adalimumab for the treatment of moderate to severe psoriasis: results from the phase 3, double-blind, placebo- and active comparator-controlled VOYAGE-2 trial. Presented at AAD 2017; Poster #P4749. 5. Langley RG, Tsai T-F, Flavin S, et al. Efficacy of switching from ustekinumab to guselkumab in patients with moderate-to-severe plaque psoriasis: results from the NAVIGATE Study. Presented at AAD 2017; Poster #P4749. 6. Blauvelt A, Papp KA, Griffiths CE, et al. Efficacy and safety of guselkumab, an anti-interleukin-23 monoclonal antibody, compared with adalimumab for the continuous treatment of patients with moderate to severe psoriasis: Results from the phase III, double-blinded, placebo- and active comparator-controlled VOYAGE-1 trial. J Am Acad Dermatol 2017; 76(3):405-17. 7. Reich K, Armstrong AW, Foley P, et al. Efficacy and safety of guselkumab, an anti-interleukin-23 monoclonal antibody, compared with adalimumab for the treatment of patients with moderate to severe psoriasis with randomized withdrawal and retreatment: Results from the phase III, double-blind, placebo- and active comparator-controlled VOYAGE-2 trial. J Am Acad Dermatol 2017; 76(3):418-31. 8. Blauvelt A, Reich K, Papp K, et al. Consistency of response across subgroups of patients with psoriasis treated with guselkumab: results from the VOYAGE-1 and -2 Trials. Presented at AAD 2017; Poster #P4895. 9. Blauvelt A, Papp K, Griffiths CE, et al. Efficacy of guselkumab within specific body regions in patients with moderate-to-severe plaque psoriasis: results from the phase 3 VOYAGE-1 Study. Presented at AAD 2017; Poster #P4768. 10. Reich K, Armstrong AW, Foley P, et al. Efficacy of guselkumab in patients with moderate-to-severe plaque psoriasis with involvement of the scalp, nails, hands, and feet: results from the phase 3 VOYAGE-2 Study. Presented at AAD 2017; Poster #P4827. 11. Blauvelt A, Papp K, Griffiths CE, et al. Patient-reported symptoms and signs in patients with moderate-severe plaque psoriasis treated with guselkumab or adalimumab: results from VOYAGE-1, a phase III clinical trial. Presented at AAD 2017; Poster #P4766. 12. Langley RG, Tsai T-F, Han C, et al. 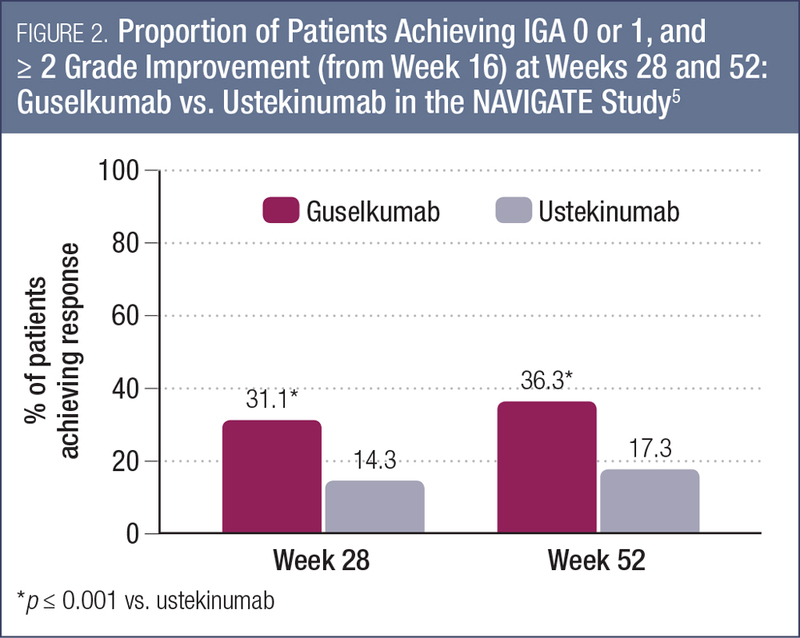 Guselkumab therapy improves patient-reported signs, symptoms and health-related quality of life of patients with moderate- severe psoriasis with inadequate response to ustekinumab: results from phase III NAVIGATE Study. Presented at AAD 2017; Poster #P917. 13. Morishima H, Goto R, Zheng R, et al. Phase 3 study of guselkumab, a human mAb directed against the p19 subunit of IL23, in Japanese subjects with generalized pustular psoriasis and erythrodermic psoriasis. Presented at AAD 2017; Poster #P4526. 14. Gottlieb A, Deodhar A, Boehncke W-H, et al. 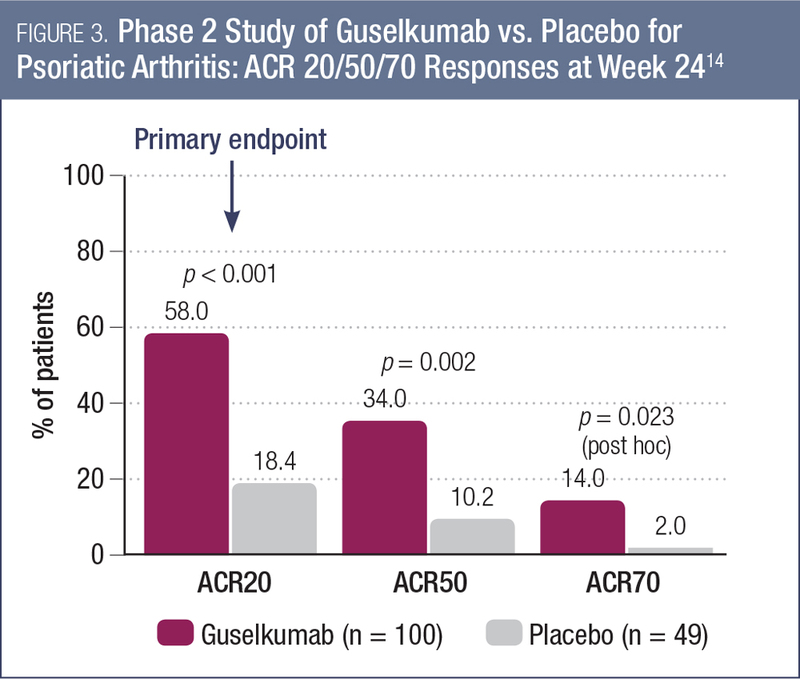 Efficacy and safety of guselkumab, an anti-IL23 monoclonal antibody, in patients with active psoriatic arthritis: a phase 2a, randomized, double-blind, placebo-controlled study. Presented at AAD 2017; Poster #P4454. 15. Reich K, Papp K, Blauvelt A, et al. Tildrakizumab, a selective IL-23p19 antibody, in the treatment of chronic plaque psoriasis: results from two randomized, controlled, phase 3 trials (reSURFACE 1 and reSURFACE 2). Presented at EADV 2016; Presentation #D3T01.1I. 16. Reich K, Papp K, Blauvelt A, et al. Tildrakizumab, a selective anti-IL-23 monoclonal antibody, is effective in subjects with chronic plaque psoriasis who do not adequately respond to etanercept. Presented at AAD 2017; Poster #P5252. 17. Papp K; Kimball AB; Tyring S, et al. Maintenance of treatment response in chronic plaque psoriasis patients continuing treatment or discontinuing treatment with tildrakizumab in a 64-week, randomized controlled, phase 3 trial. Presented at AAD 2017; Poster #P4855. 18. Papp K, et al. Onset and duration of clinical response following treatment with a selective IL-23p19 inhibitor (BI 655066) compared with ustekinumab in patients with moderate-to-severe chronic plaque psoriasis. Presented at EADV 2015; abstract #FC03.06. 19. Reich K, Lacour JP, Dutronc Y, et al. Efficacy and safety of ixekizumab compared to ustekinumab after 24 weeks of treatment in patients with moderate-to-severe plaque psoriasis: Results from IXORA-S, a randomized head-to-head trial. Presented at AAD 2017; Presentation #5078. 20. Blauvelt A, Muram T, See K, et al. Clearing of psoriasis within different body regions following 12 weeks of treatment with ixekizumab. Presented at AAD 2017; Poster #P4551. 21. Pariser D, Heffernan M, Dennehy EB, et al. The effects of age, gender, weight, age at onset, psoriasis severity, nail involvement, and presence of psoriatic arthritis at baseline on the efficacy of ixekizumab in patients with moderate-to-severe psoriasis. Presented at AAD 2017; Poster #P4622. 22. Blauvelt A, Gooderham M, Iversen L, et al. Efficacy and safety of ixekizumab for the treatment of moderate-to-severe plaque psoriasis: results through 108 weeks of a randomized, phase III clinical trial (UNCOVER-3). Presented at AAD 2017; Poster #P4376. 23. Kimball AB, Zachariae C, Burge R, et al. The effect of ixekizumab on scalp and nail psoriasis and health outcome measures over four years of open-label treatment in a phase 2 study in chronic plaque psoriasis. Presented at AAD 2017; Poster #P4530. 24. Lebwohl M, Adams D, McKean-Matthews M, et al. Ixekizumab efficacy in patients with moderate-to-severe plaque psoriasis and co-morbid psoriatic arthritis: four year results from a phase 2 study. Presented at AAD 2017; Poster #P4629. 25. Romiti R, Valenzuela F, Chouela EN, et al. Ixekizumab treatment shows no evidence for reactivation of previous or latent tuberculosis infection in patients with psoriasis: an integrated analysis of 7 clinical trials. Presented at AAD 2017; Poster #P4550. 26. Wu JJ, Egeberg A, Solomon JA, et al. Ixekizumab treatment shows a neutral impact on the glucose and lipid profile of patients with moderate-to-severe psoriasis: results from UNCOVER-1, -2, and -3. Presented at AAD 2017; Poster #P4662. 27. Gomez EV, Bishop JL, Jackson K, et al. Treatment with ixekizumab does not interfere with the efficacy of tetanus and pneumococcal vaccines in healthy subjects. Presented at AAD 2017; Poster #P5105. 28. Feldman SR, Pangallo B, Xu W, et al. Ixekizumab and pregnancy outcome. Presented at AAD 2017; Poster #P4532. 29. Strober B, Jazayeri S, Thaçi D, et al. Secukinumab provides faster and more sustained 52-week complete relief from psoriasis-related pain, itching, and scaling than ustekinumab in subjects with moderate to severe plaque psoriasis. Presented at AAD 2017; Poster #4449. 30. Secukinumab Provides greater 52-week improvements in patient-reported outcomes than ustekinumab in patients with moderate to severe psoriasis. Presented at AAD 2017; Poster #4797. 31. Vender R, Leonardi C, Puig L, et al. Secukinumab provides greater cumulative 52-week skin clearance and quality of life benefit in patients with moderate to severe plaque psoriasis than ustekinumab: an area-under-the-curve analysis. Presented at AAD 2017; Poster #4798. 32. Blauvelt A, Mehlis S, Vanaclocha F, et al. Secukinumab provides greater 52-week sustained relief from dermatology-related quality of life impact on clothing choice and sexual function than ustekinumab. Presented at AAD 2017; Poster #4799. 33. Gottlieb AB, Pariser D, Tsai T-F, et al. Secukinumab provides greater 52-week sustained relief in dermatology-specific quality of life impact than ustekinumab. Presented at AAD 2017; Poster #4800. 34. Puig L, Griffiths CE, Gilloteau I, et al. Secukinumab provides greater improvement in quality of life, work productivity, and daily activity than ustekinumab in patients with moderate-to-severe psoriasis: a structural equation modeling approach using the CLEAR Study. Presented at AAD 2017; Poster #5447. 35. Gottlieb AB, Lebwohl M, Gilloteau I, et al. Secukinumab provides greater skin clearance and improvement in skin-related quality of life than ustekinumab for biologic-naïve patients with psoriasis: results from the CLEAR 52-week study. Presented at AAD 2017; Poster #5458. 36. Feldman S, Green L, Kimball AB, et al. Secukinumab improves scalp pain, itching, scaling, and quality of life in patients with moderate to severe scalp psoriasis. Presented at AAD 2017; Poster #4905. 37. Reich K, Arenberger P, Mrowietz U, et al. Secukinumab shows high and sustained efficacy in nail psoriasis: 1.5 year results from the TRANSFIGURE study. Presented at AAD 2017; Poster #5501. 38. Bissonnette R, Luger T, Thaçi D, et al. Secukinumab provides sustained improvements in dermatology-specific quality of life in moderate to severe psoriasis patients through 3 years of treatment: results from the SCULPTURE extension study. Presented at AAD 2017; Poster #4223. 39. Gottlieb AB, Sullivan J, Kubanov A, et al. Secukinumab shows significant improvement in patient-reported outcomes in difficult-to-treat palmoplantar psoriasis: 1.5 year data from the GESTURE study. Presented at AAD 2017; Poster #5232. 40. Blauvelt A, Reich K, Warren RB, et al. Secukinumab retreatment shows rapid recapture of treatment response: an analysis of a phase 3 extension trial in psoriasis. Presented at AAD 2017; Poster #4879. 41. Georgakopoulos JR, Ighani A, Yeung J. Efficacy and safety of secukinumab (IL-17A inhibitor) in treating moderate to severe plaque psoriasis in two real-world academic dermatology clinics: a Canadian multicenter retrospective study. Presented at AAD 2017; Poster #4443. 42. Vender R, Yanofski H, Boucher A, et al. Early real-world effectiveness of secukinumab in the treatment of psoriasis in Canada: retrospective analysis of patient support program data. Presented at AAD 2017; Poster #5756. 43. Gottlieb AB, Strober B, Armstrong AW, et al. Secukinumab in psoriasis patients with concurrent psoriatic arthritis: patient-reported outcomes in the corrona psoriasis registry. Presented at AAD 2017; Poster #4432. 44. Gottlieb AB, Strober B, Armstrong AW, et al. Secukinumab in psoriasis patients with concurrent psoriatic arthritis: demographics and disease characteristics in the Corrona Psoriasis Registry. Presented at AAD 2017; Poster #4511. 45. Lebwohl M, Strober B, Menter A, et al. Phase 3 studies comparing brodalumab with ustekinumab in psoriasis. N Engl J Med 2015; 373(14):1318-28. 46. Papp KA, Reich K, Paul C, et al. A prospective phase III, randomized, double-blind, placebo-controlled study of brodalumab in patients with moderate-to-severe plaque psoriasis. Br J Dermatol 2016; 175(2):273-86. 47. SILIQ™ (brodalumab) prescribing information (USA). Revised 02/2017. 49. Lebwohl MG, Green L, Hsu S, et al. Improvement in nail psoriasis with brodalumab in phase 3 trials. Presented at AAD 2017; Poster #5296. 50. Papp KA, Lebwohl MG, Bhatt V, et al. Rapid onset of efficacy in patients with psoriasis treated with brodalumab versus ustekinumab: A pooled analysis of data from two phase 3 randomized clinical trials (AMAGINE-2 and AMAGINE-3). Presented at AAD 2017; Poster #5138. 51. Blauvelt A, Lebwohl MG, Green LJ, et al. Median time to treatment response in patients with moderate-to-severe plaque psoriasis treated with brodalumab 210 mg or ustekinumab: A pooled analysis of data from two phase 3 randomized clinical trials (AMAGINE-2 and AMAGINE-3). Presented at AAD 2017; Poster #5092. 52. Papp KA, Lebwohl MG, Krueger JG, et al. Impact of previous biologic use and failure on efficacy of brodalumab and ustekinumab: A pooled analysis of data from two phase 3 randomized clinical trials in moderate-to-severe plaque psoriasis (AMAGINE-2 and AMAGINE-3). Presented at AAD 2017; Poster #4978. 53. Lebwohl M, Papp KA, Wu JJ, et al. Psychiatric adverse events in brodalumab psoriasis studies. Presented at AAD 2017; Poster #4908. 54. Strober B, Eichenfield LF, Armstrong A, et al. Overview of adverse cardiovascular events in the brodalumab psoriasis studies. Presented at AAD 2017; Poster #4758. 55. Gottlieb AB, Blauvelt A, Leonardi C, et al. Certolizumab pegol treatment for chronic plaque psoriasis: 16-week primary results from two phase 3, multicenter, randomized, placebo-controlled studies. Presented at AAD 2017; Presentation #5077. 56. Bissonnette R, Harel F, Krueger JG, et al. TNF-a antagonist and vascular Inflammation in patients with psoriasis vulgaris: a randomized placebo-controlled study. Presented at AAD 2017; Presentation #5076. 57. Gelfand J. Getting to the heart (and other comorbidities) of psoriasis. Presented at AAD 2017; Plenary Lecture. 58. Leonardi C, Kelleher C, Tang H, et al. Evaluation of CHS-0214 as a proposed biosimilar to etanercept for the treatment of chronic plaque psoriasis: one-year results from a randomized, double-blind global trial. Presented at AAD 2017; Poster #5158. 59. Blauvelt A, Fowler JF, Schuck E, et al. A randomized, double-blind, multicenter study to compare the efficacy, safety, and immunogenicity of a proposed adalimumab biosimilar (GP2017) with originator adalimumab in patients with moderate-to-severe chronic plaque psoriasis. Presented at AAD 2017; Poster #5224. 60. Langley R & Gordon K. Which biologic to start first: an IL-17/IL-23 or aTNF blocker. A debate at AAD 2017. ﻿﻿Copyright 2017 STA HealthCare Communications Inc. All rights reserved. This program is published by STA HealthCare Communications Inc. as a professional service funded by Janssen Inc. The information and opinions contained herein reflect the views and experience of the authors and not necessarily those of Janssen Inc. or STA HealthCare Communications Inc. Any products mentioned herein should be used in accordance with the prescribing information contained in their respective product monographs.